Revlon Uniq One All in One Hair Treatment 5.1 oz. "uniq one - All in one Treatment"
The Revlon Professional uniq one hair treatment ​is a hair care innovation that meets all your needs from a hair care product. Be it dry, fine, dyed, damaged or oily hair, the hair treatment is suitable for all hair types. The spray combines a solution for ten different hair problems in one product, simplifying everyday hairstyling and creating space in your bathroom cabinet. That’s because you now only need one hair product for all of these uses: the uniq one - All in one Treatment. With these 10 caring treatments, the most important needs of all types of hair are covered and even the most demanding hair is dealt with. 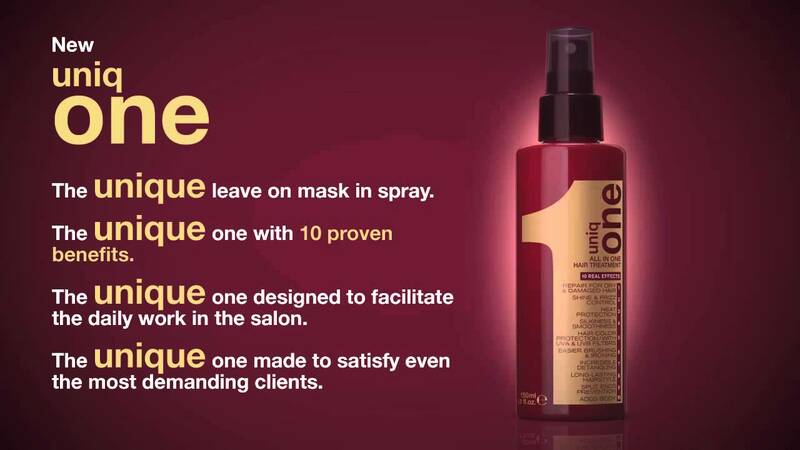 The Revlon uniq one spray also impresses genuine hair professionals with its quality and uniqueness. Revlon has written a success story with its uniq one bestseller. Still not convinced? Then be inspired by the reviews of our customers. The uniq one - All in one Treatment is also an all-rounder when it comes to the application. You can apply the product to wet or dry hair. We recommend using no more than the recommended amount of sprays. Otherwise the hair can become difficult to treat. Spray at a distance of 20 cm. For short hair use approx. 6-8 sprays, for medium-long hair approx. 7-12 sprays, for long hair approx. 10-15 sprays. Detangle the hair with a comb; use your preferred styling product. Style your hair as usual: Blow dry, straighten or let your hair dry naturally. Use your preferred finishing product. Spray product onto your palm. For short hair use approx. 2-3 sprays, for medium-length hair approx. 3-5 sprays, for long hair approx. 4-6 sprays. Distribute the product from halfway to the end of your hair. If necessary, use a styling product, style the hair with a hair dryer or straightener and/or use a finishing product. Long-lasting silky, smooth, shiny, healthy and protected hair even when stressed through regular straightening or dyeing. Hair is easier to comb, with good hold, defined curls and volume following use of the uniq one ​​treatment spray.